I hope everyone is doing great! Last week’s reading showed hobbies being turned into business ventures and being confident with creative projects. so let’s see what this week has in stored for us. As always, I’ll be using the lenormand and the Oracle Of the Shapeshifters. This week’s theme is about women. LOL so ladies, this week’s reading will be about you! (sorry gentlemen!) 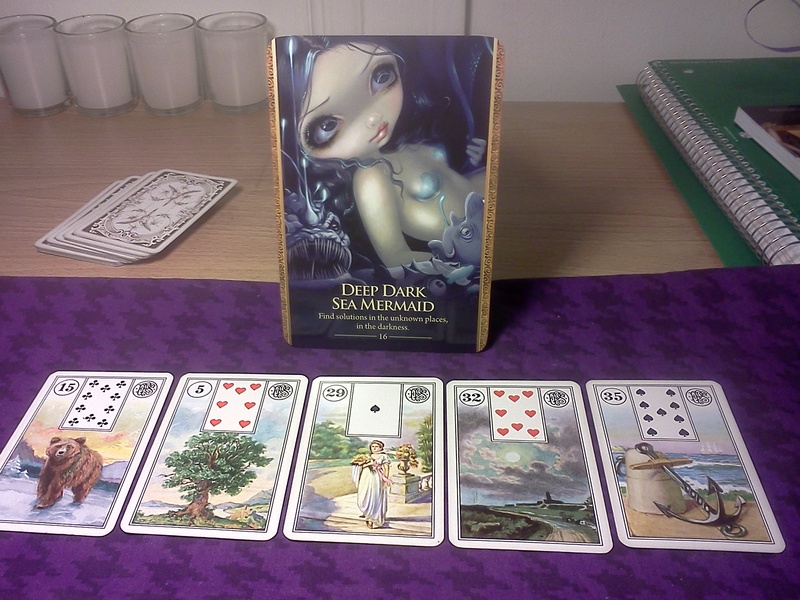 The deep dark sea mermaid tells me that many of us has had emotional instability, anxiety or perhaps even depression lately in our lives and can’t quite pinpoint the cause. The woman/moon combo makes me think that its related to the hormones being unbalanced in some way. Oddly enough the cards are pointing to some of that instability is the result of our diet. The bear points to nutrition, while the tree talks about our health. I feel the cards are advising to take a good look at your eating habits. Are you eating too much processed food?, too much salt? Sugar? This week reading encourages you to eliminate bad food and incorporate a more “clean” diet as this will stabilize your emotions (as shown in the anchor) and you’d be surprised how much better and happier you’ll feel! It’s interesting how our diet not only affects our physical bodies but also our emotions and spirit. Have a safe week and feel free to comment!